There is certainly a range of views among UK car firms about the advisability of the 2040 target. Jaguar Land Rover (JLR) has said publicly that it expects to meet the government’s current proposed standards long before the set date. A spokesman said: “From 2020, every new Jaguar and Land Rover will have the option of electrification. But other manufacturers discussing the issue on condition of anonymity told BBC News the proposed 2040 standards are ill-considered. One criticised the idea currently under consideration by the Department for Transport to force hybrid cars, by 2040, to have the capacity to travel 50 miles without burning fossil fuels. The car maker said this would require a much bigger battery entailing more weight and cost. That extra capacity would be redundant for most of the time for an average driver. The issue is causing headaches for many other governments needing to cut emissions that cause local air pollution and climate change. India’s transport minister announced 2030 as a day beyond which only all-electric cars may be sold. But after a barrage of criticism from car firms, he rescinded the order, and India’s policy is not yet clear. Tata Motors in Delhi did not want to comment on whether it could cope with a 2030 all-electric policy. What is certain is that in Europe and Asia, car makers are being expected to move inexorably towards low or zero emissions vehicles. The car makers admit they face uncertainty over the future. After decades of homogenisation of world markets, they may find themselves manufacturing electric cars to access the Chinese economy on the one hand and petrol SUVs for Texas on the other. Car makers think China will probably become a world leader in car standards – especially in cities. The UK car firms are in concert on one issue: the need for the government to radically improve the supply of charging infrastructure, and to increase incentives to buy low-emissions cars. They told BBC News ministers would need to move swiftly to accelerate demand for clean cars, or it would be impossible to step up production levels to the amount needed by 2040. Electric and hybrid cars currently constitute 1.4% of the current UK fleet. Of new sales, 4.7% are clean fuel – that’s 119,786 out of 2.54 million cars sold last year. 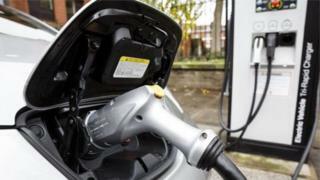 Mike Hawes from the SMMT told BBC News: "Vehicle manufacturers will increasingly offer electrified versions of their vehicles giving consumers ever more choice but industry cannot dictate the pace of change nor levels of consumer demand." Environmentalists say this is a red herring – car buyers, they say, will buy whatever vehicles are permitted to be sold in the country at that time. The environment department Defra is concerned that their colleagues in transport at DfT have had their ambition dulled by car industry lobbying. The DfT didn’t want to address that comment.